Most Americans don't have sufficient wealth to worry about the value of the dollar next week, much less next year. A steady, low double-digit increase in the cost of living seems baked into the model of the U.S. economy for generations. Politics is the short-term factor governing the probability of crises. Americans are an instinctively self-reliant, isolationist people who might very well turn their backs on the world if given a free choice. All along the way, conservative economists and political figures have warned the American people about the dangers of inflation, but most Americans don’t have sufficient wealth to worry about the value of the dollar next week, much less next year. Even were the United States to return to the gold standard tomorrow, the wizards of Wall Street would find a way to create new vehicles for leverage and speculation. In a free society, the tendency of human beings to use debt, derivatives and other forms of leverage to earn nominal profits discourages and defeats the most sincere efforts to protect the soundness of money. The history of the ebb and flow of monetary policy and financial regulation in the United States suggests that politics is the short-term factor governing the probability of crises, but this evolution is set against the backdrop of an increased role for the state in money and banking generally. The degree of regulatory capture or better, cooperation, between the various parts of the financial community, the housing industry, the U.S. Congress and the regulators, seems to have made the most recent crisis inevitable. But even as Congress responds with legislation to reform the private financial services sector, the role of the public sector in all aspects of private banking and finance seems to be growing. If inflation and debt are the obvious problems facing the United States, and if the American political class is unwilling to make changes in fiscal and monetary policy to address these problems, then what does the future hold for Americans and the nations who trade with and invest in the United States? For a start, at home the likelihood is for a continuing diminution of real living standards, asset values and economic opportunities due to inflation. Today there seems to be no appetite on the part of Americans to address fiscal imbalances and the related problem of inflation in the way in which presidents such as Gerald Ford or Jimmy Carter attempted to do in the 1970s and 1980s. A steady, low double-digit increase in the cost of living, regardless of what the heavily manipulated official inflation statistics indicate, seems baked into the model of the U.S. economy for generations. 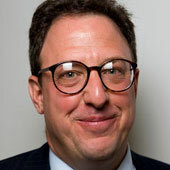 But the major point of vulnerability for the United States may not be inflation per se but diminished economic growth and a gradually weaker dollar, both of which will diminish the influence of America in the world. In addition to the fact of secular inflation in American economic life, the export of American jobs to other countries and the related decline in the dollar cost of many consumer goods have masked the true rate of inflation in the United States. Successive U.S. governments have managed to keep the value of the dollar artificially high because of the need to borrow hundreds of billions of dollars each year to finance chronic fiscal deficits. Just as the large federal spending deficits and debt represent future inflation, the equally persistent trade and current account deficits run by the United States are likewise a reflection of the degree to which the rest of the world finances the American economy and depends upon it for growth. The subsidy provided to the United States by foreign nations depends upon America’s willingness to borrow, which now seems to be waning. 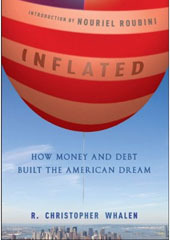 Editor’s Note: This is an excerpt from Christopher Whalen’s book, “Inflated: How Money and Debt Built the American Dream,” published by Wiley on December 7, 2010. Copyright 2010 Christopher Whalen. Reprinted with permission of the author.